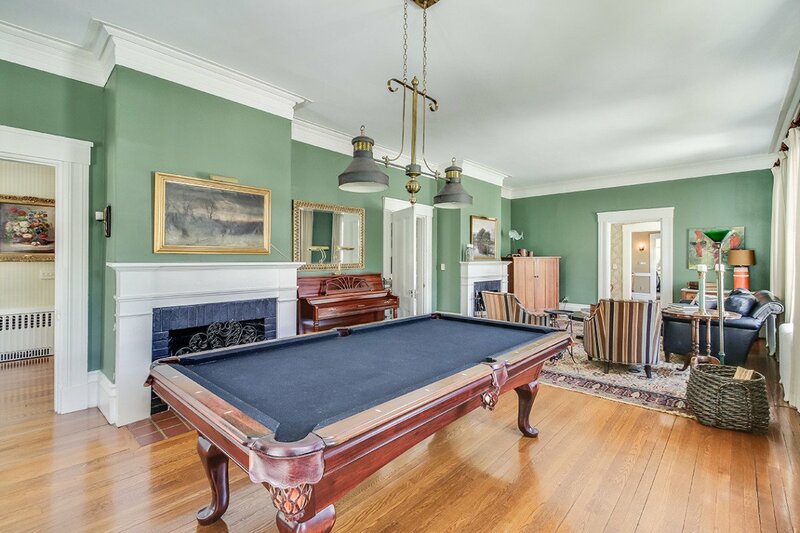 With new condos and high-rise apartments dominating the Boston housing market, it’s a rarity to discover old gems. 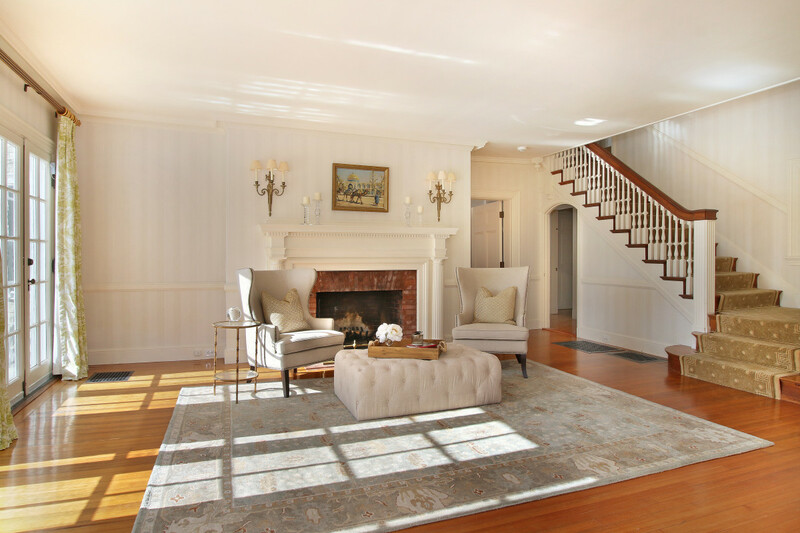 These antique homes offer spacious quarters, brick fireplaces, grand staircases, modern amenities, and an inviting charm to make all buyers feel right at home. 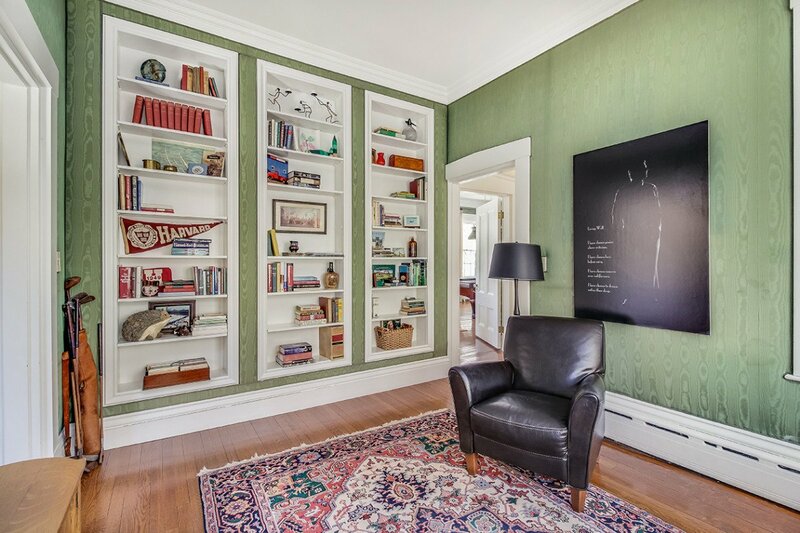 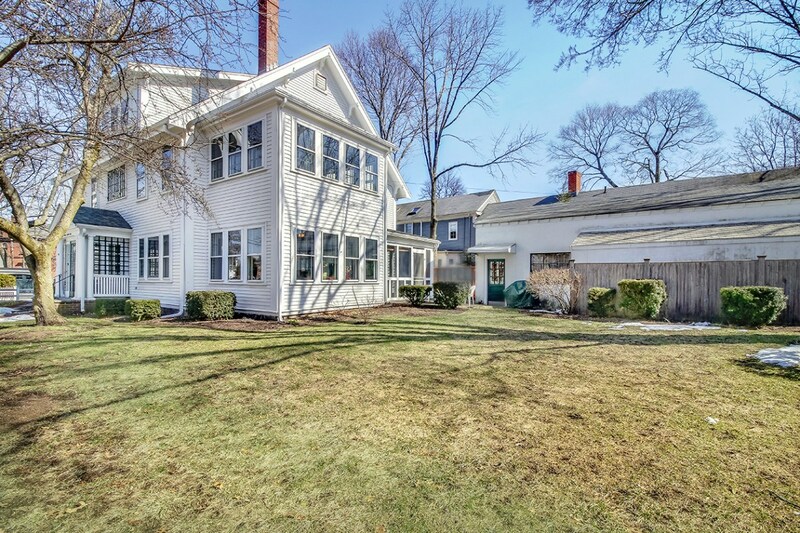 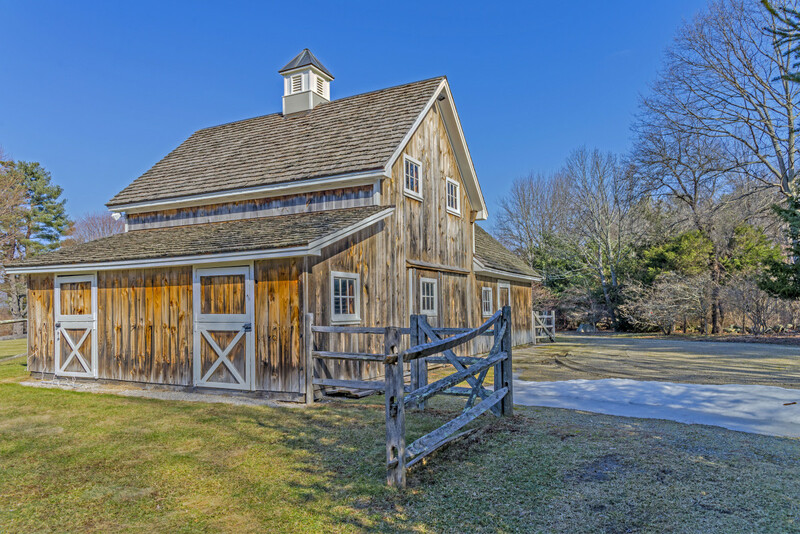 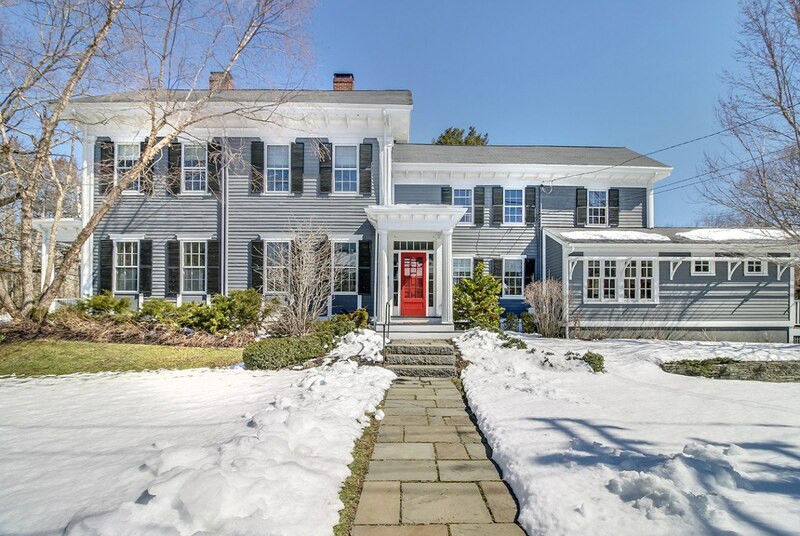 Check out these five enviable listings in Dedham, Westwood, and Dover, and gain an appreciation for the antique life. 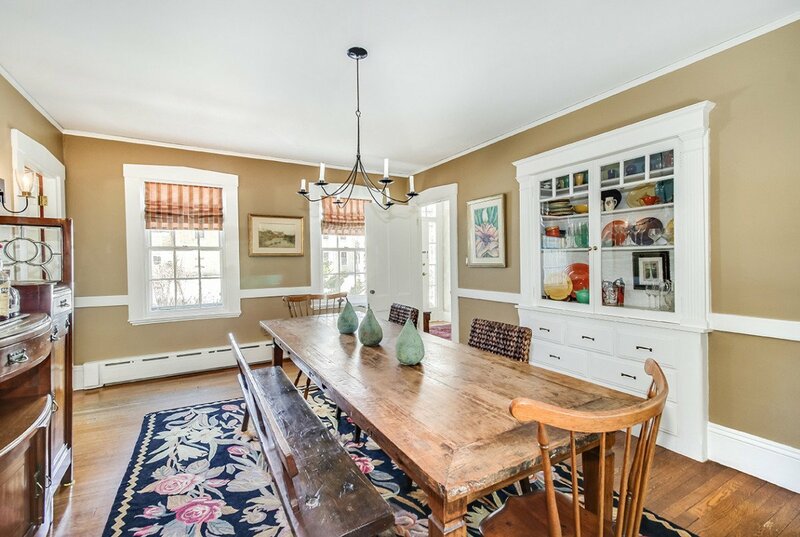 Lovingly maintained and tastefully renovated throughout the years, this home maintains its character while accommodating today’s style of living. 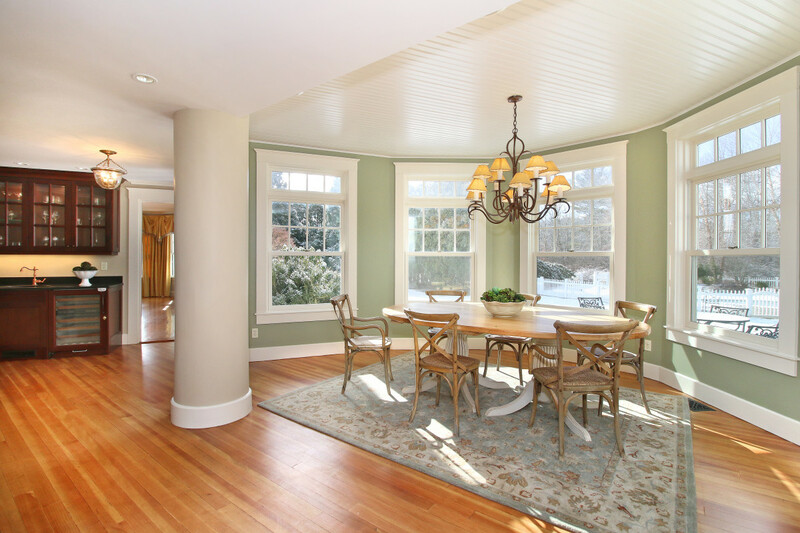 High ceilings throughout, wood floors, moldings, and rich detail enhance the home. 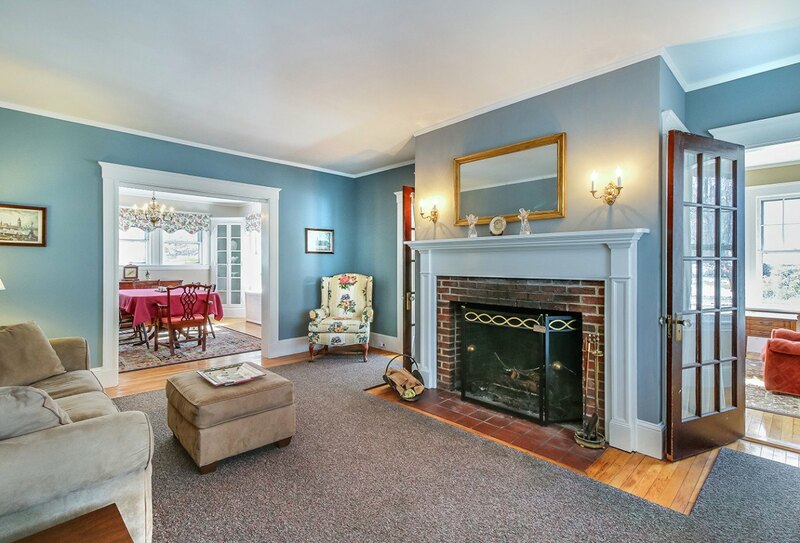 The front porch welcomes you into a double parlor with two large fireplaces, a large dining room, a recently renovated kitchen with island, new appliances, a separate desk area with built-ins, a laundry room, two powder rooms, a mudroom off the garage, den, and double staircases. 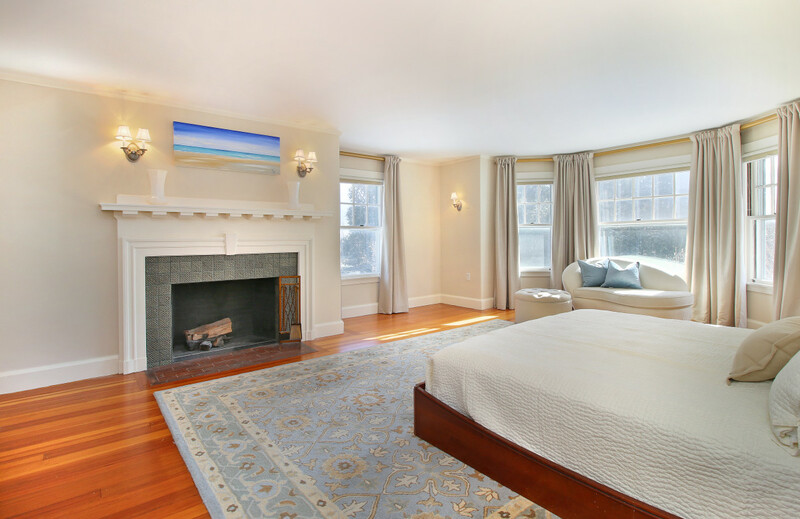 The second floor includes a large master suite with a separate sitting room and double sinks in the full bath. 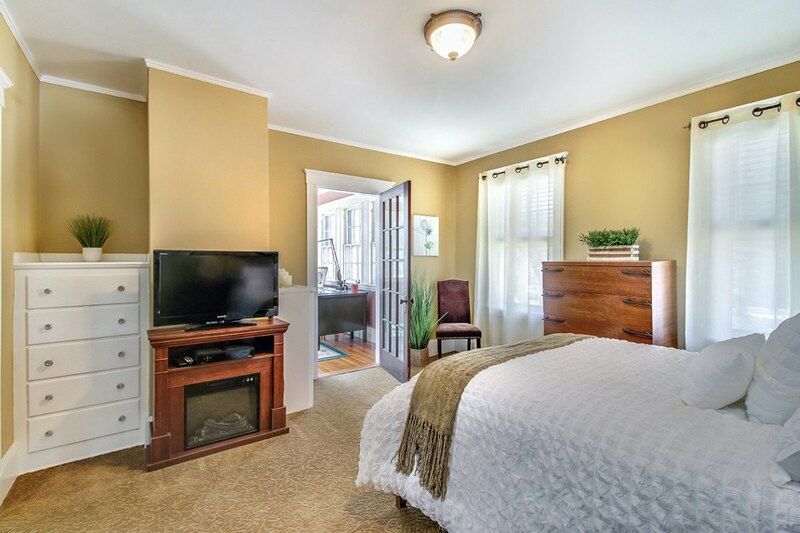 Two additional bedrooms are generously sized with good closets and large windows. 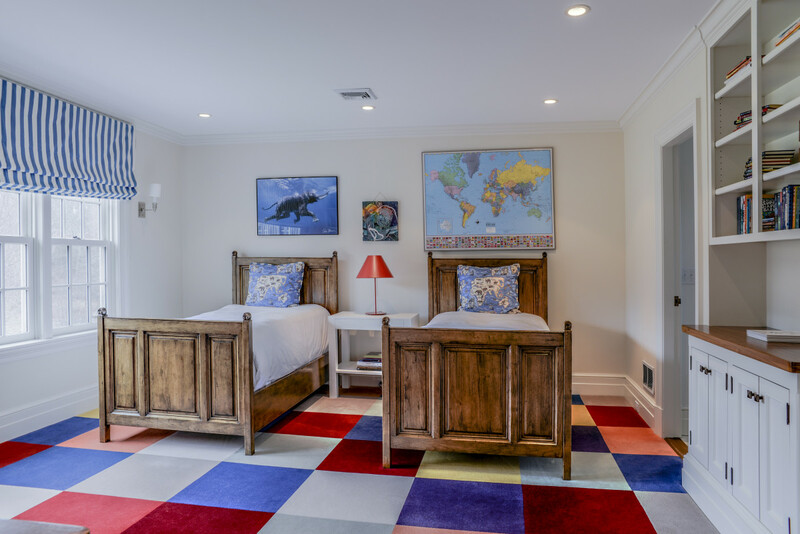 The third floor is finished with an additional bedroom and sitting room, plus a fully finished lower level with a wine cellar. 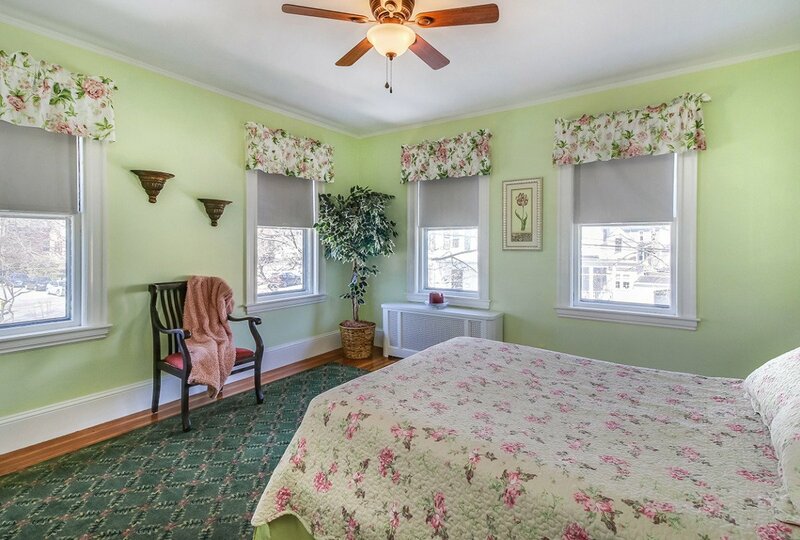 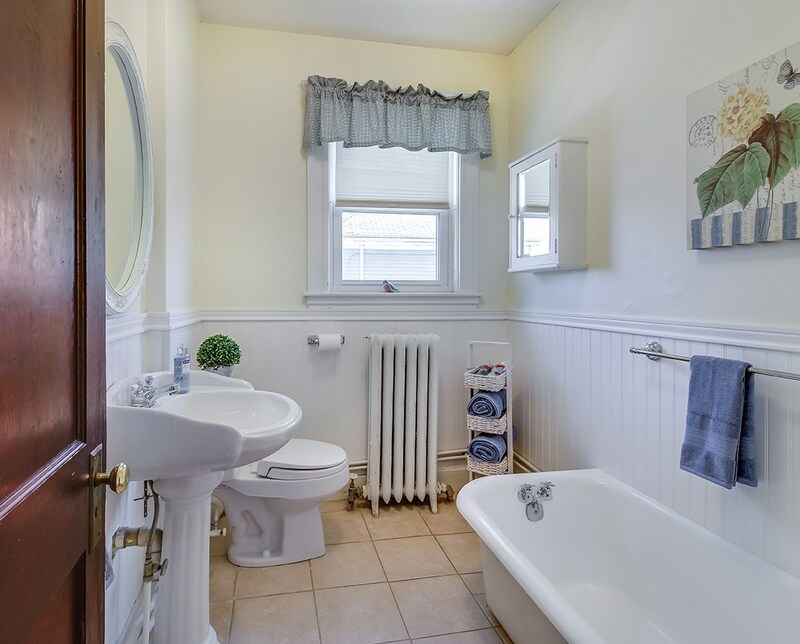 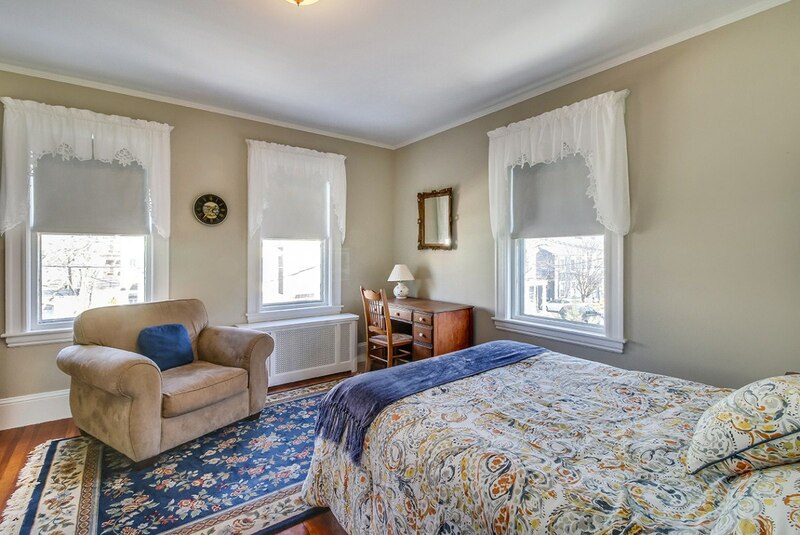 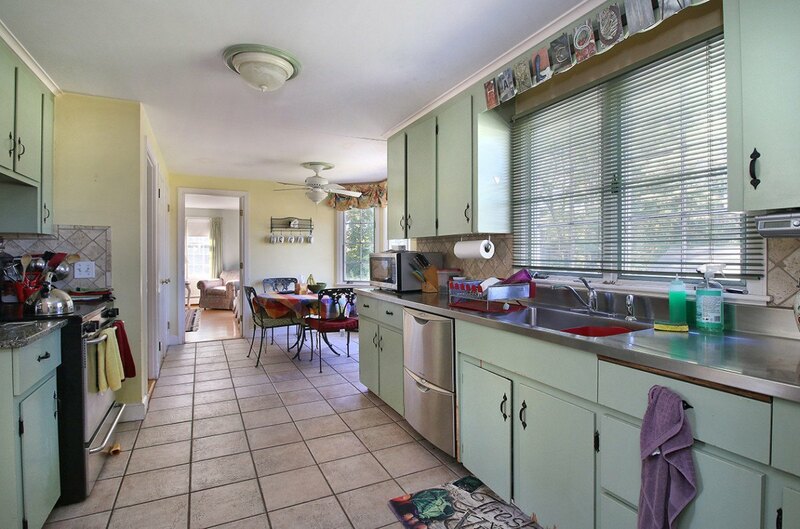 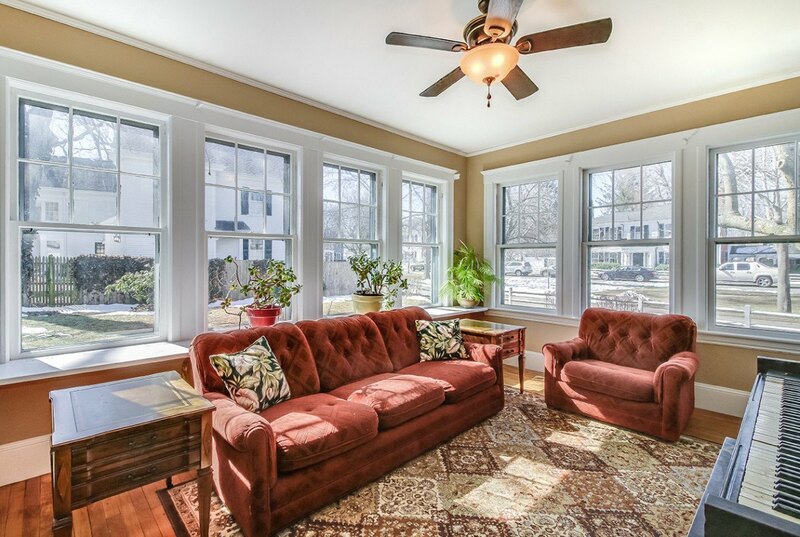 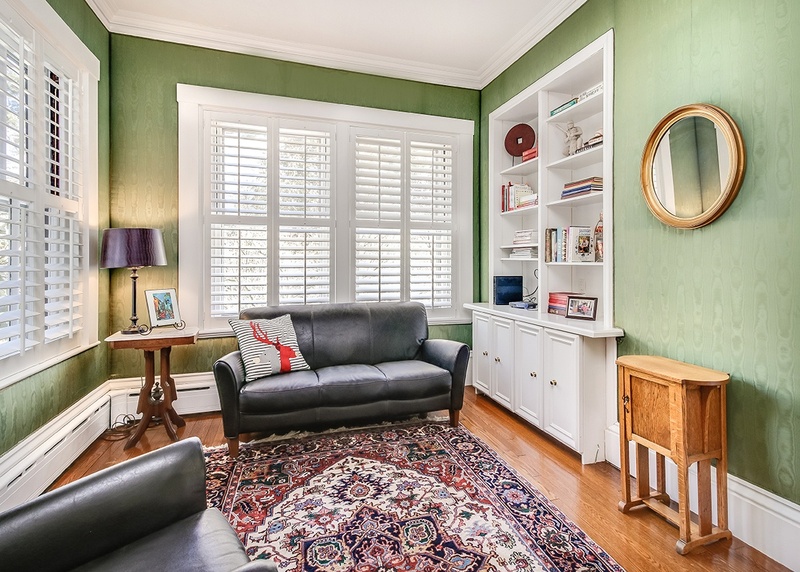 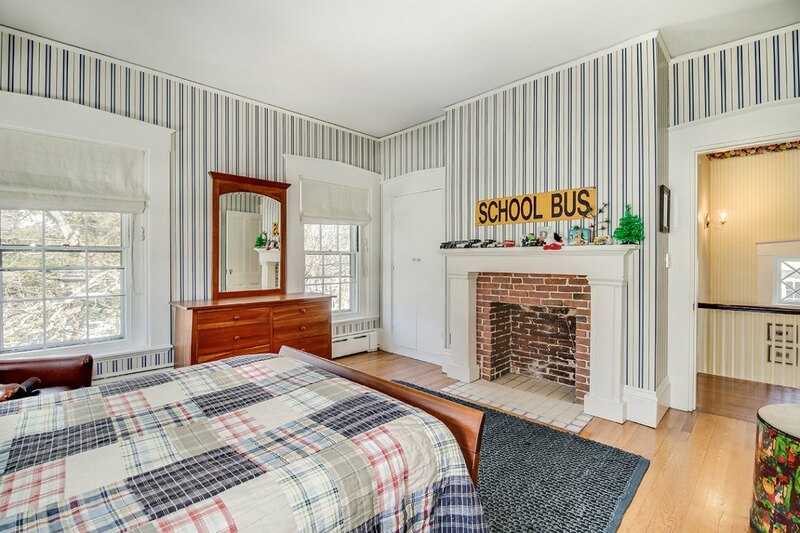 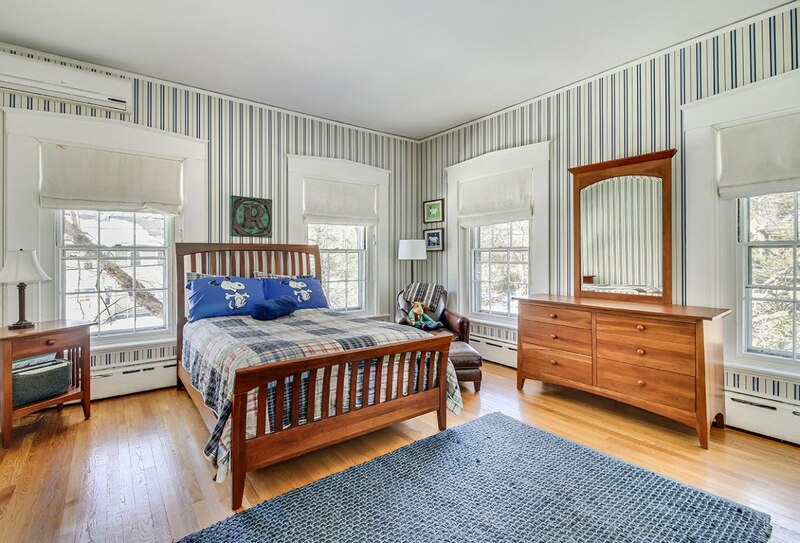 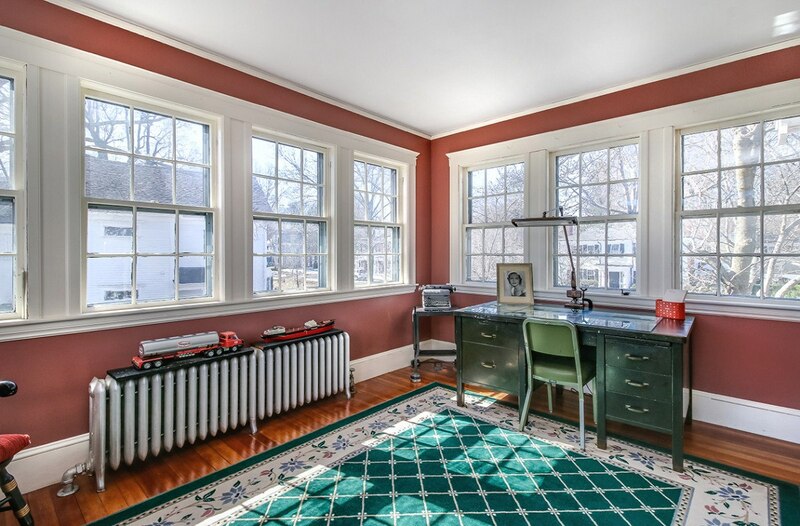 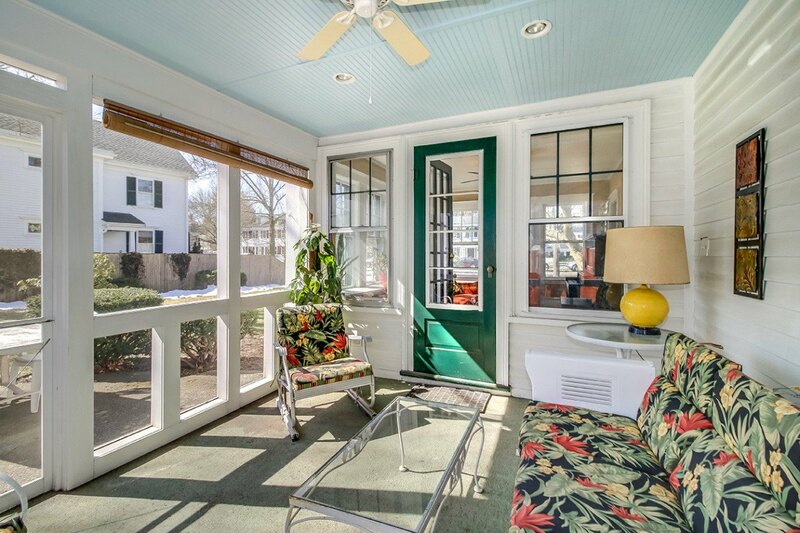 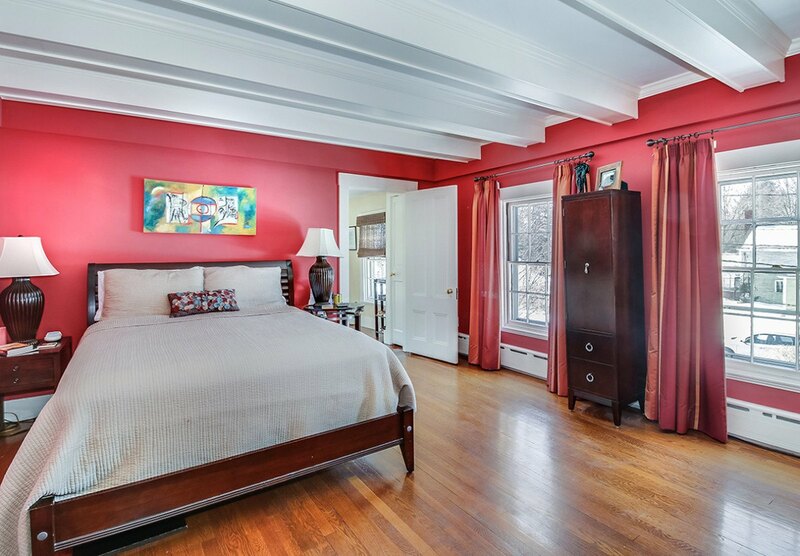 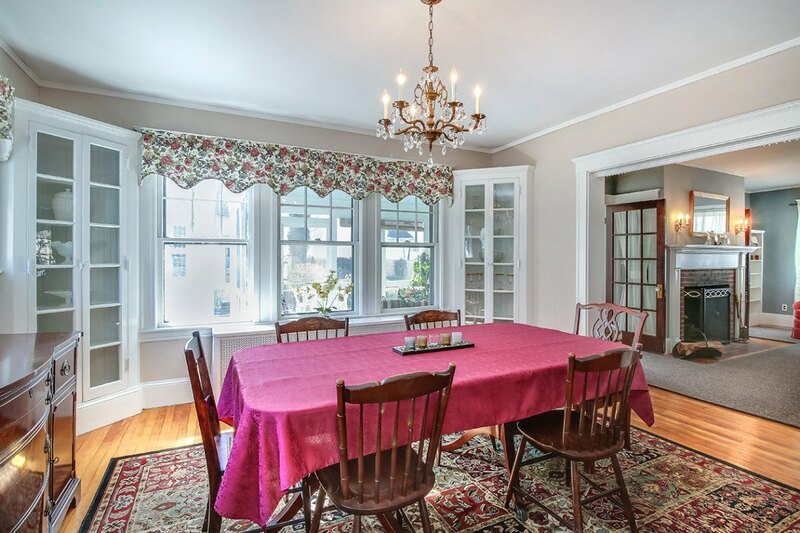 This well maintained home in popular Franklin Square is ready to move in and offers wonderful, sun-drenched rooms. 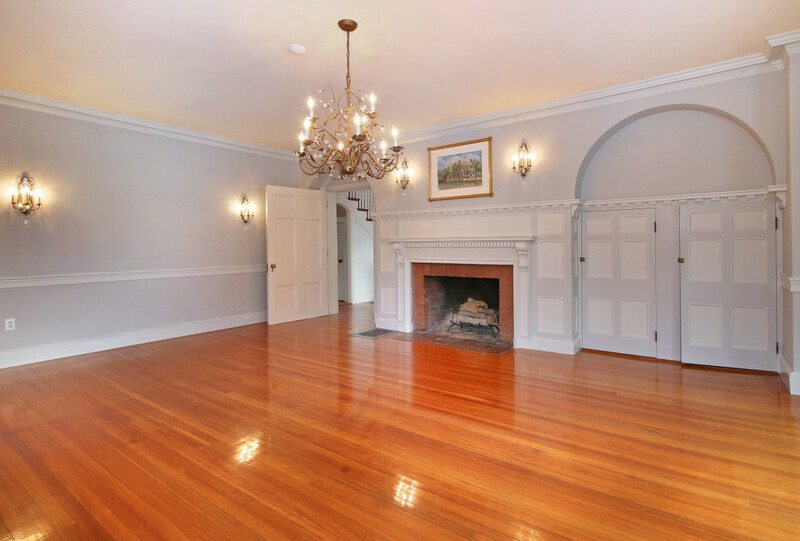 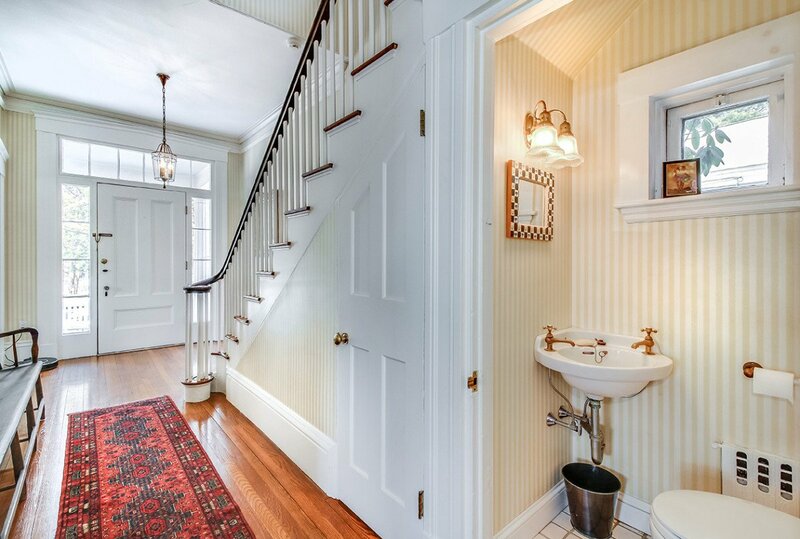 High ceilings, gorgeous woodwork, and gleaming hardwoods are present throughout. 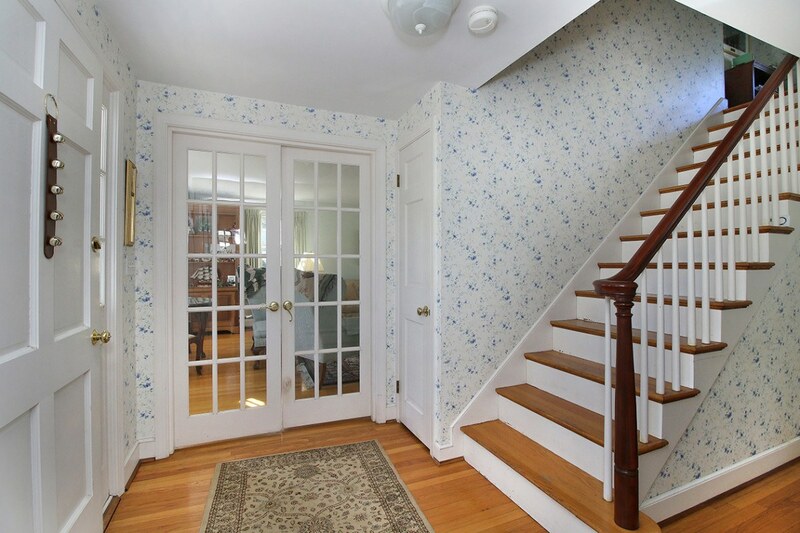 Enter through the front covered porch into the large entrance foyer. 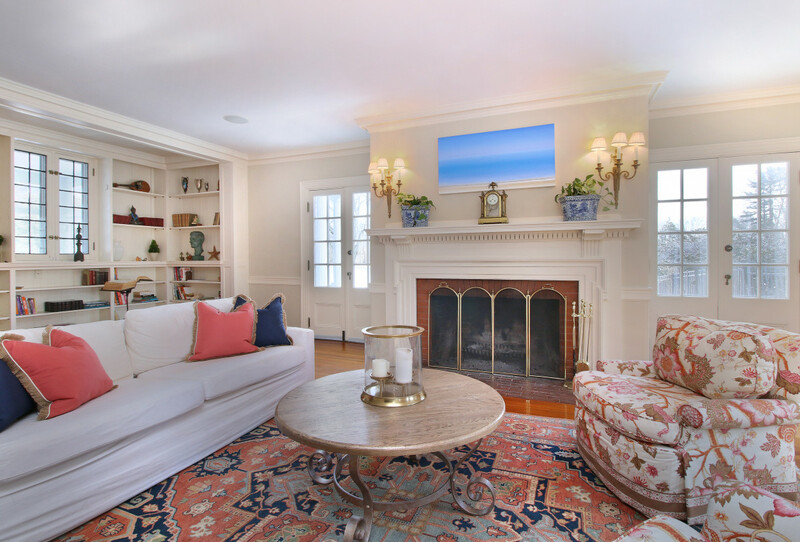 The fireplace living room has built-ins and French doors that open to a glass sunroom and further lead to a screened porch, formal dining room with built-ins, a large butler’s pantry, a bright eat-in kitchen, den, mudroom, two powder room, and front and back staircases. 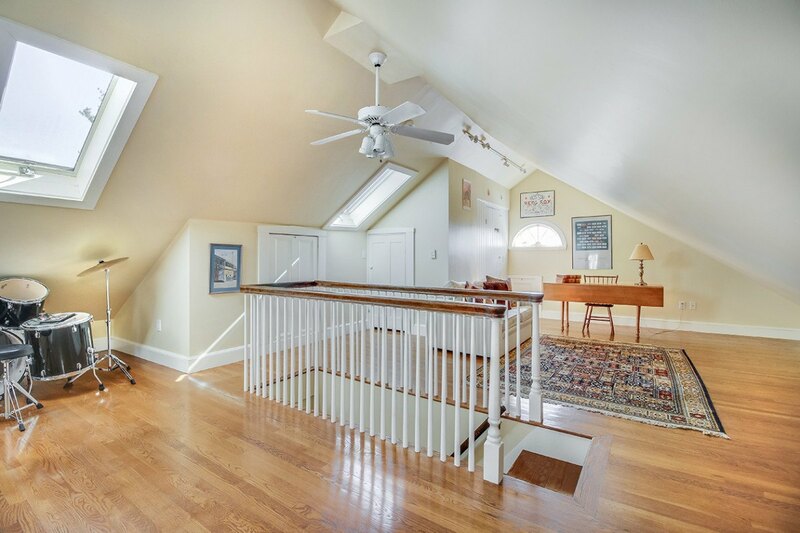 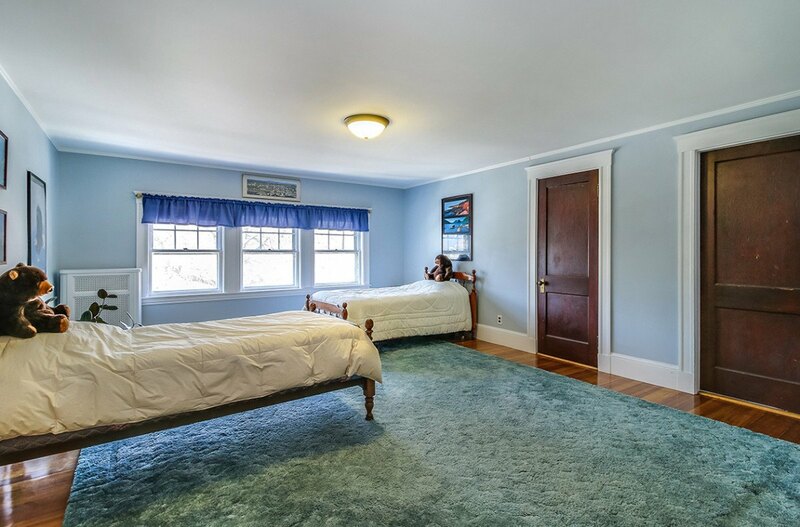 The large second floor landing leads to four bedrooms with ample closets. 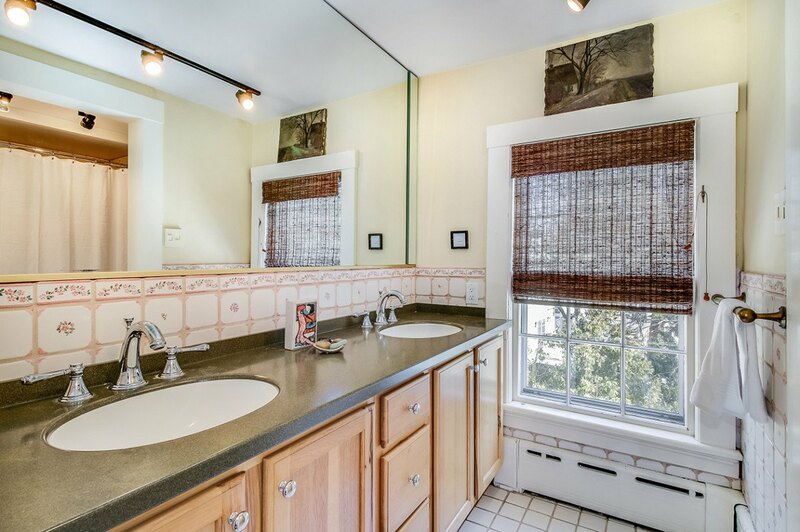 The master suite has an attached bath and office. 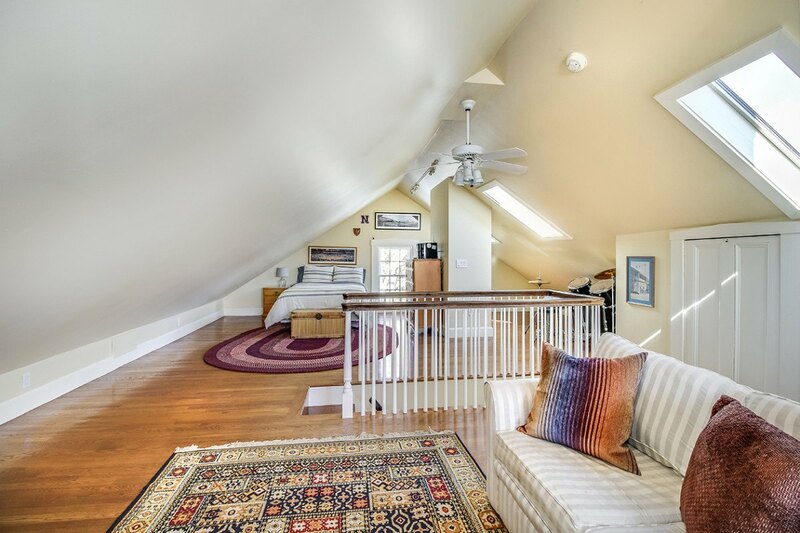 The third floor is also finished with two additional bedrooms, more storage, and a cedar closet. 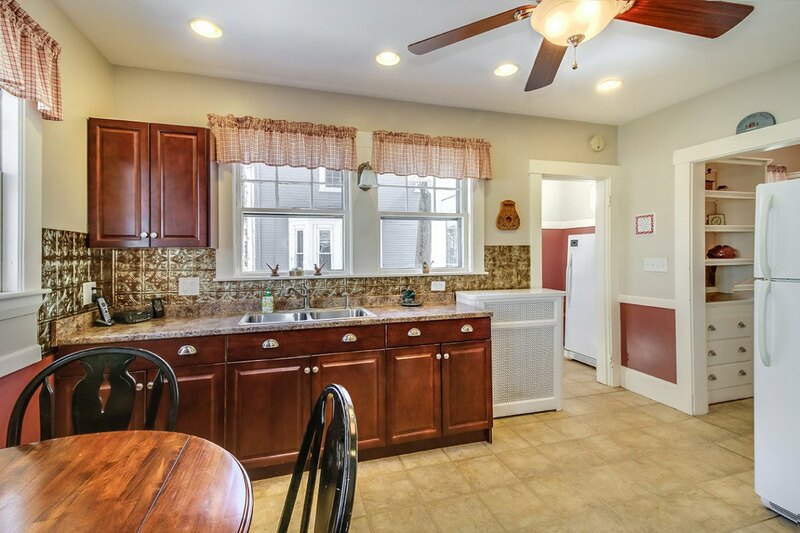 The yard is fenced and there is a detached four-plus car garage with plenty of storage space. 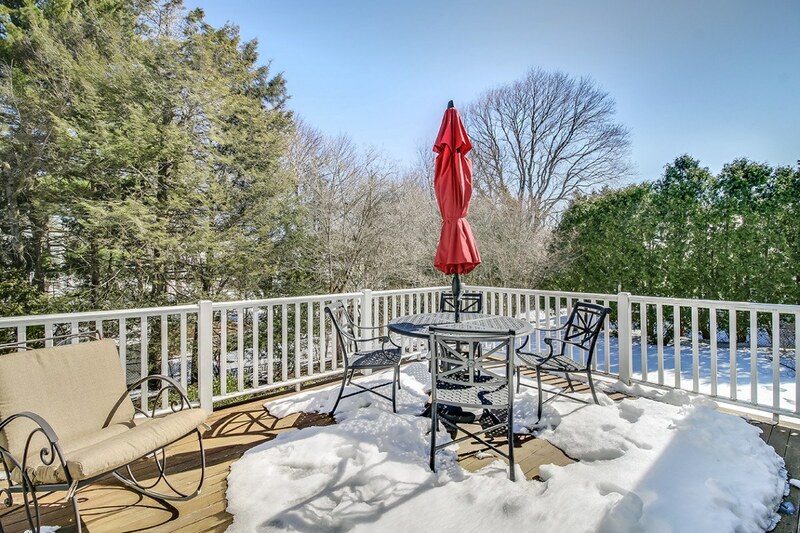 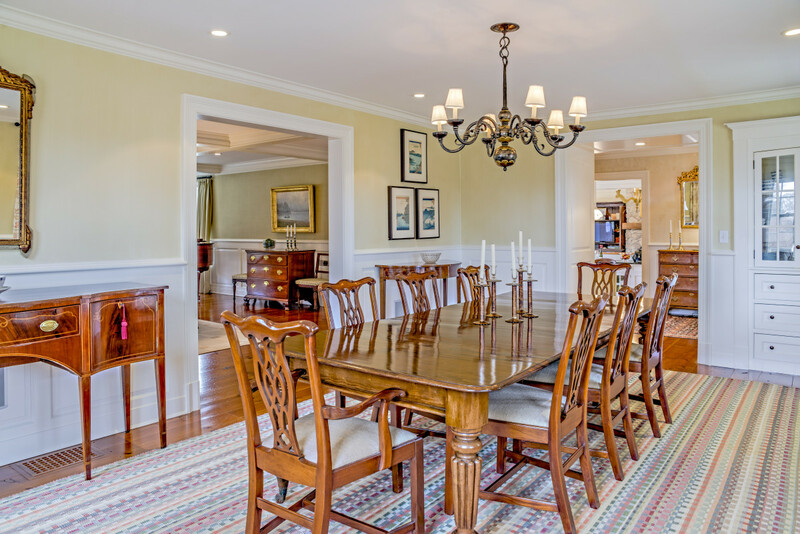 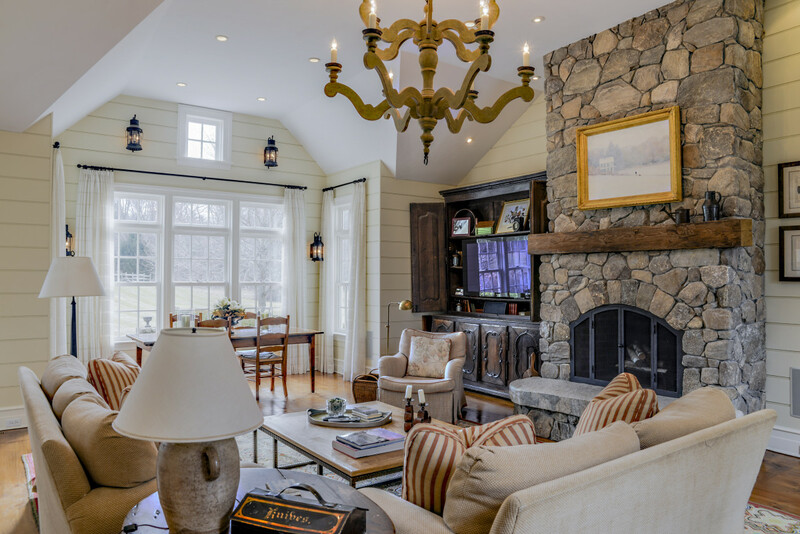 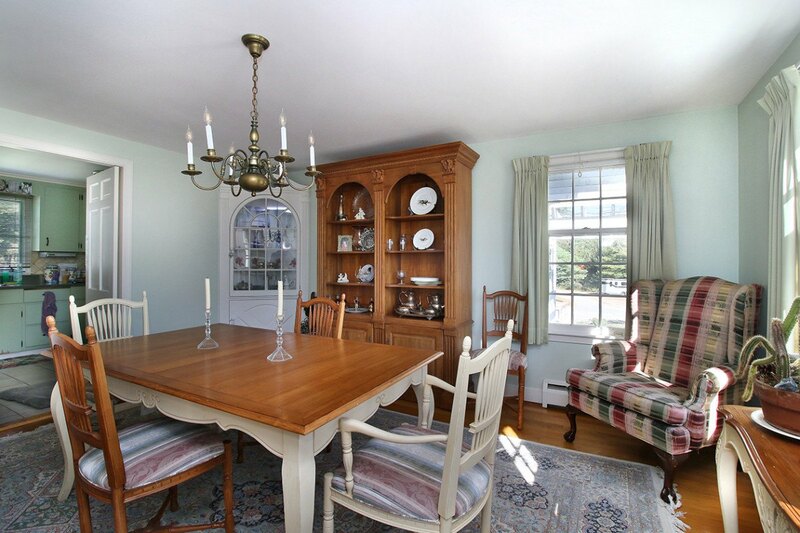 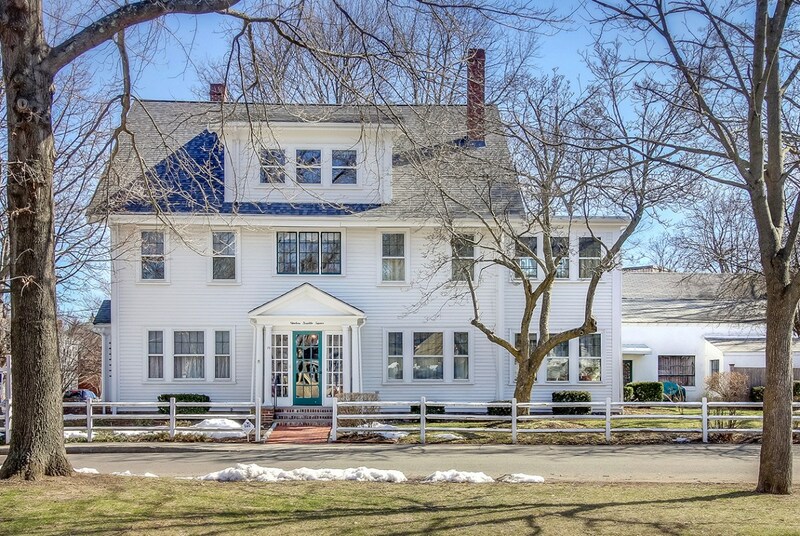 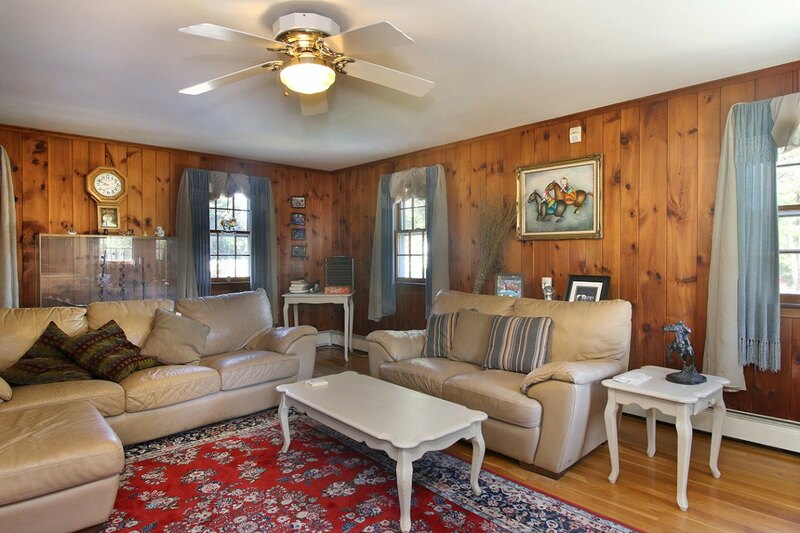 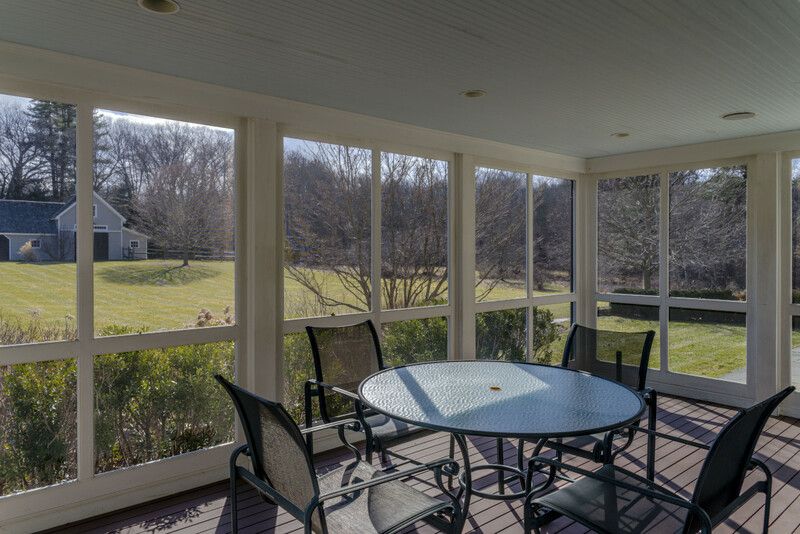 This traditional colonial sits on more than eight acres with existing horse stables. 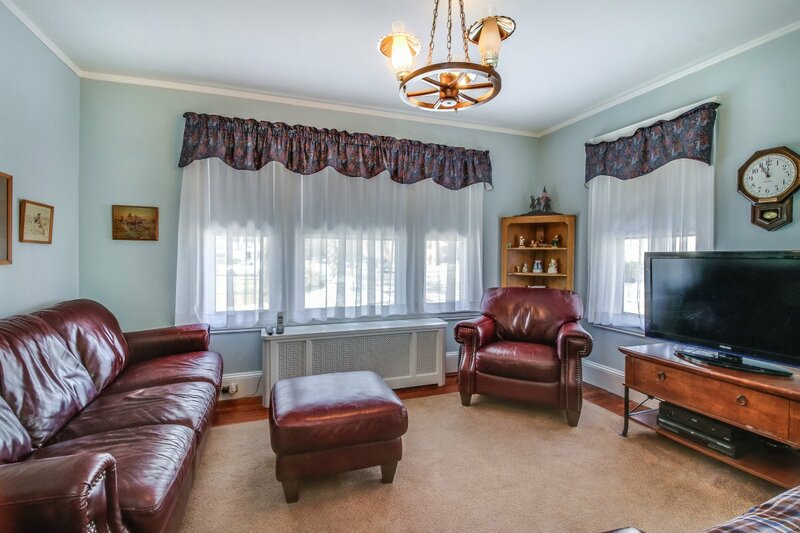 Complete with four bedrooms inside and an added adjacent bedroom, the home has a formal living room, dining room, eat-in kitchen, hardwood floors, and family room with fireplace. 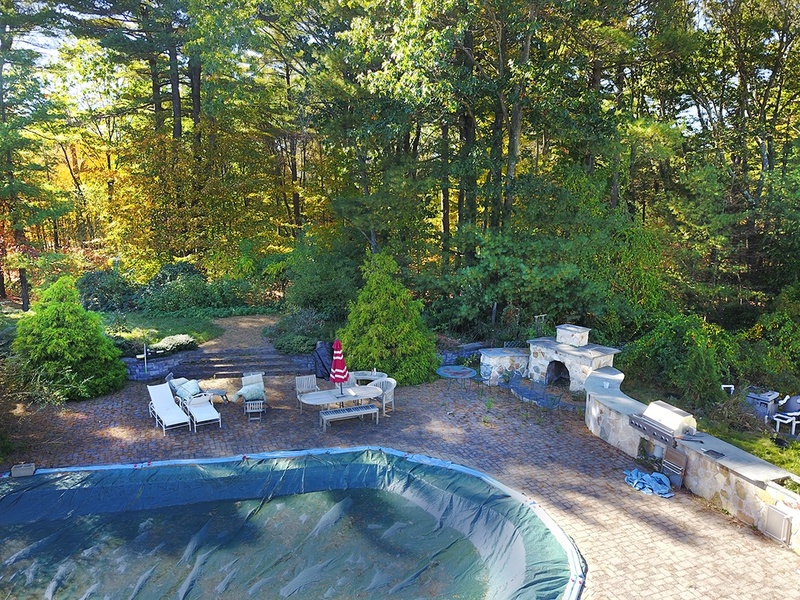 The in-ground pool features a waterfall and Koi pond, plus an enclosed patio area. 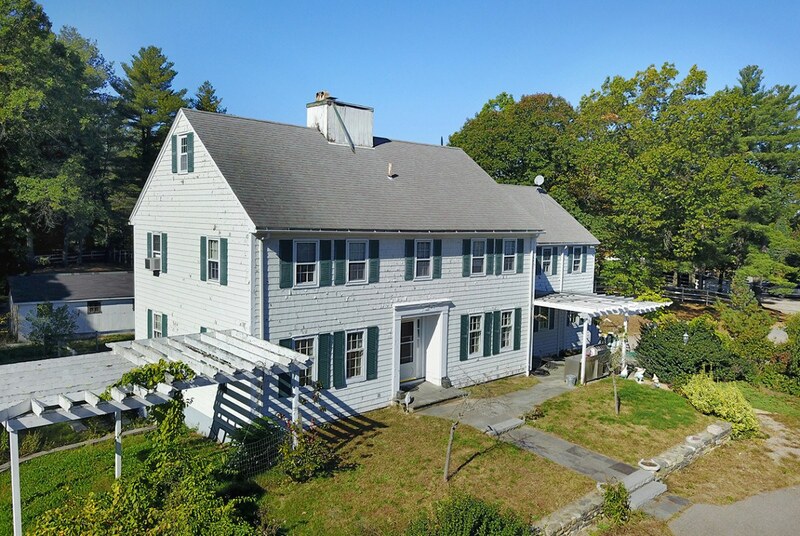 A guest house on premises was built in 1880 with three bedrooms, one bath, living room, dining room, and galley kitchen. 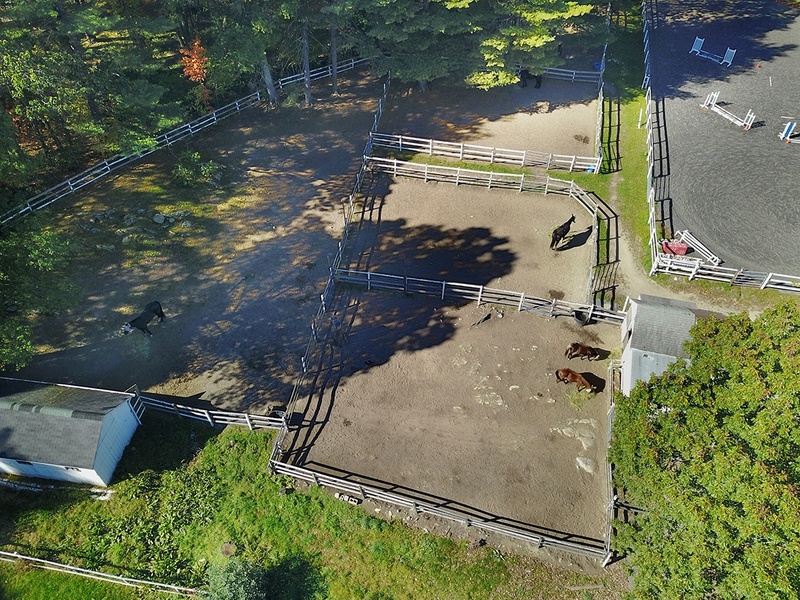 Additional buildings on property include a five-stall barn with heated tack room; the second floor of barn has a large finished room with cabinets and sink with a full bath. 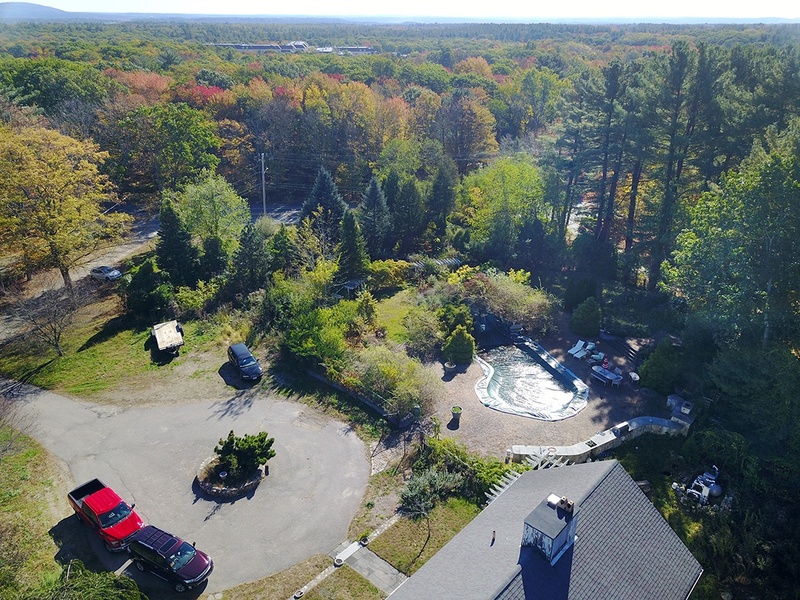 There is also a small pond on the property. 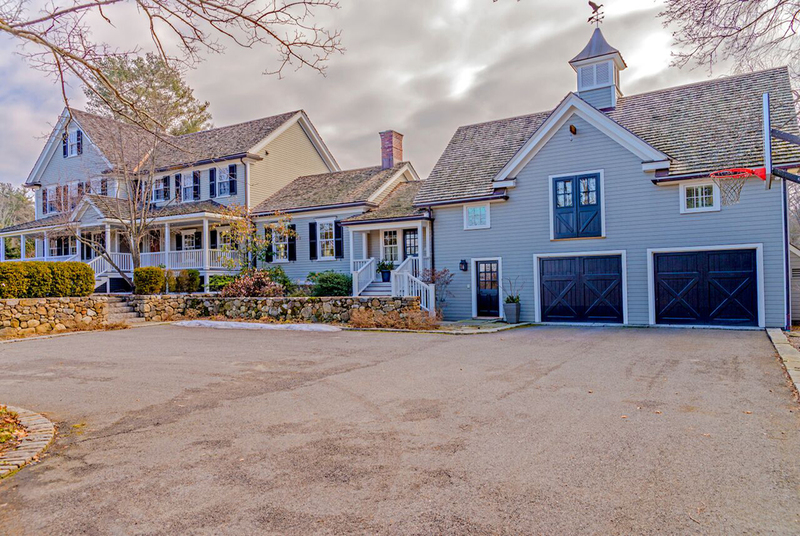 This newer custom-built home offers luxury amenities, while showcasing the exquisite details of an antique farmhouse. 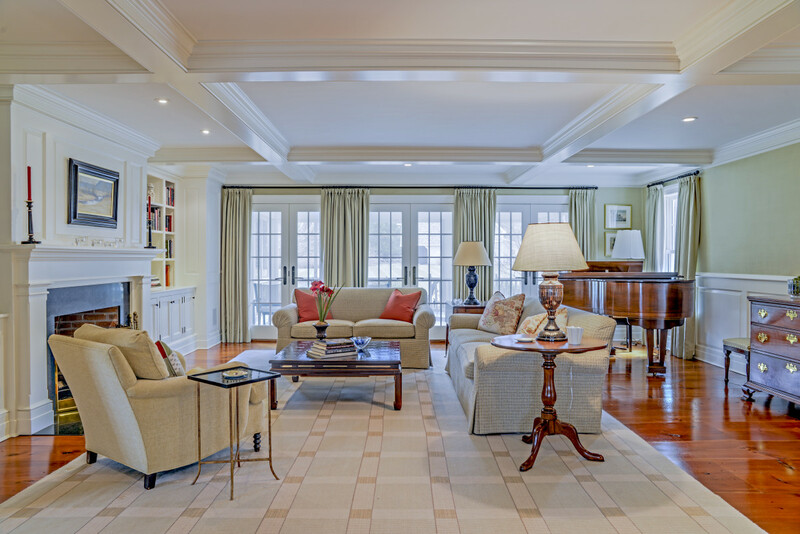 With wide pine planked floors, coffered ceilings, and floor-to-ceiling windows, this thoughtfully planned living space combines perfect flow for entertaining and warm family areas. 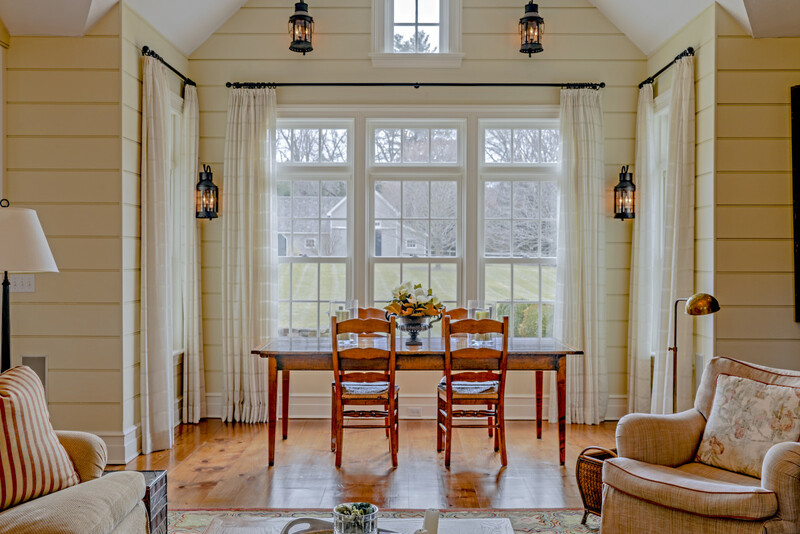 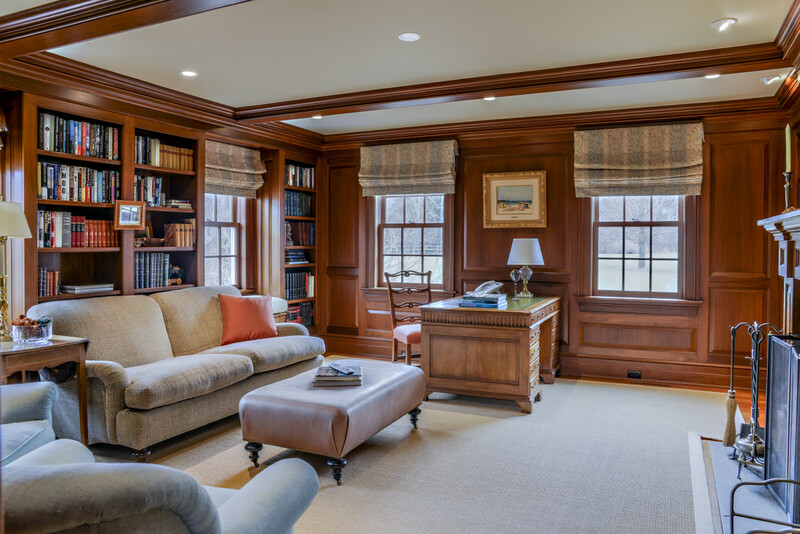 The inviting formal living room leads to glass doors out to the sun porch, overlooking private manicured pastoral grounds and barn. 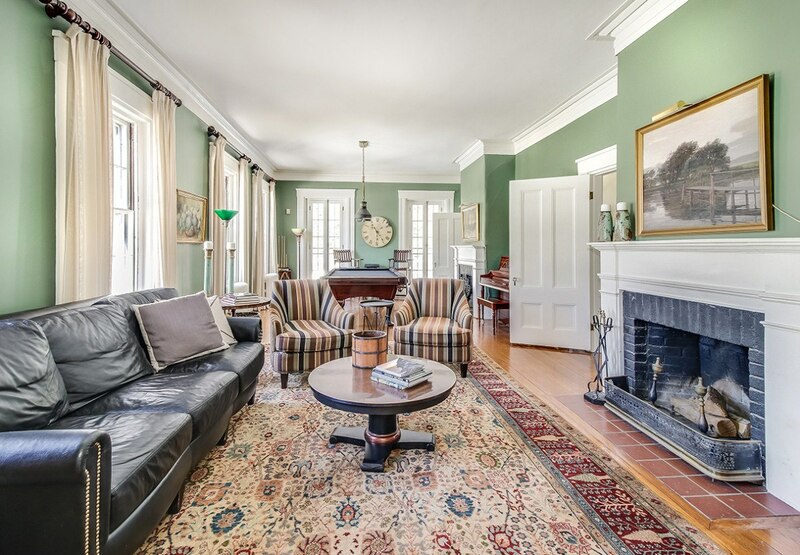 The house features four fireplaces, including the mahogany library and family room. 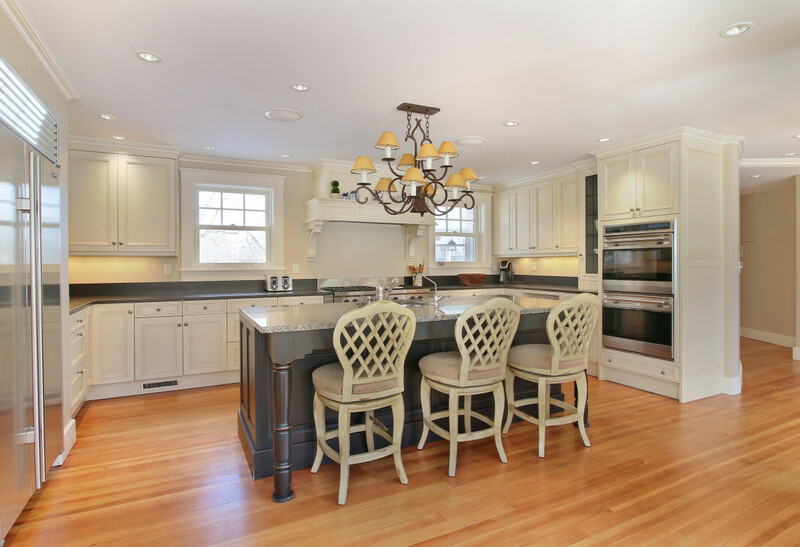 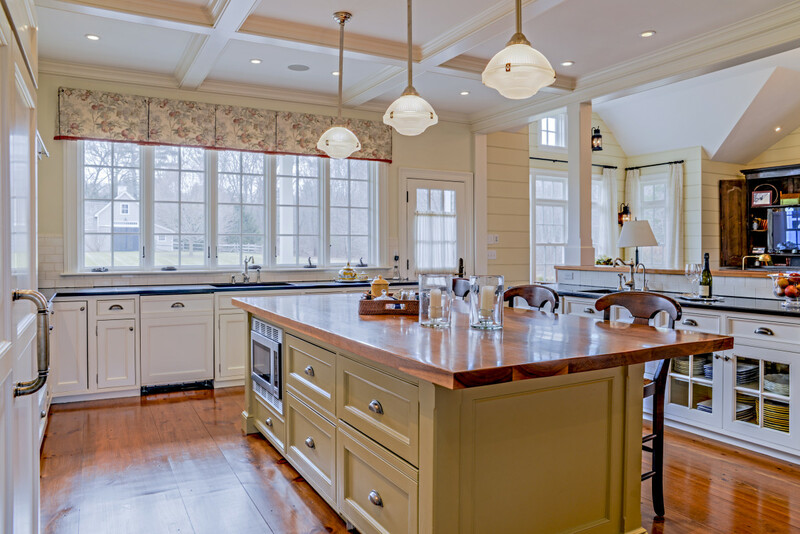 The open gourmet kitchen has an expansive seated island and breakfast area. 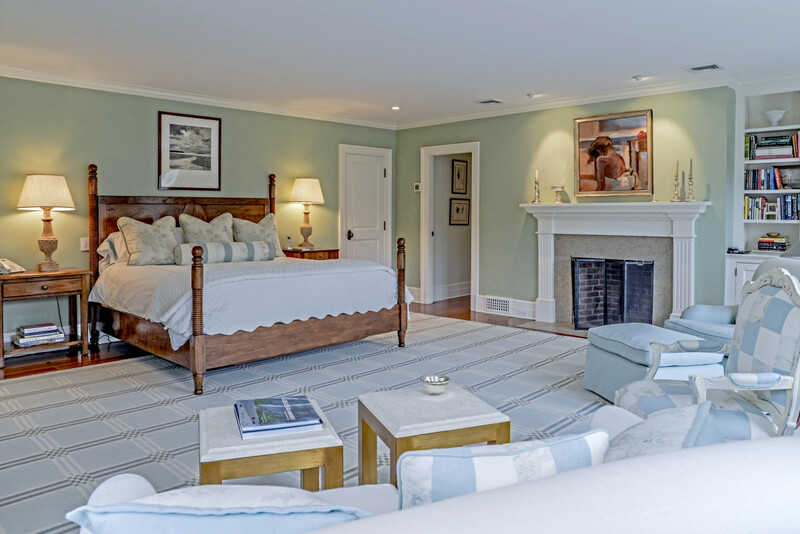 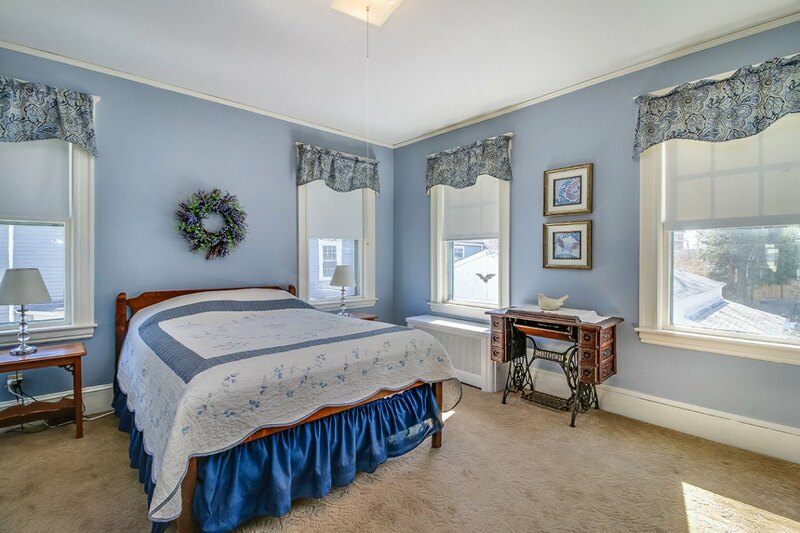 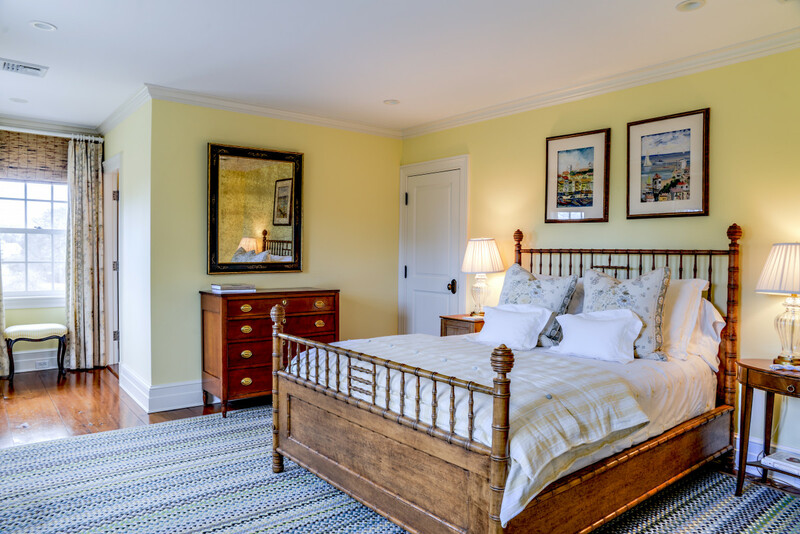 Second floor bedrooms are ensuite with built-ins and the master suite has scenic balcony views and large master bath. 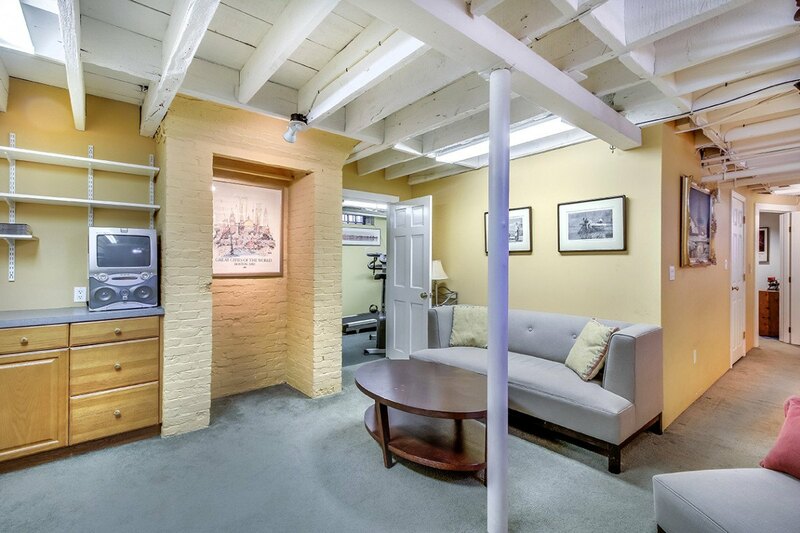 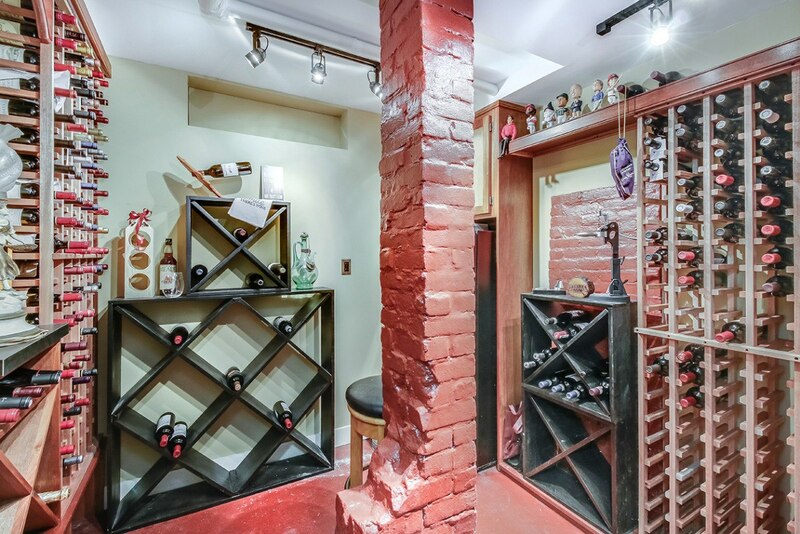 The finished lower level includes a wine cellar, gym, and rec room. 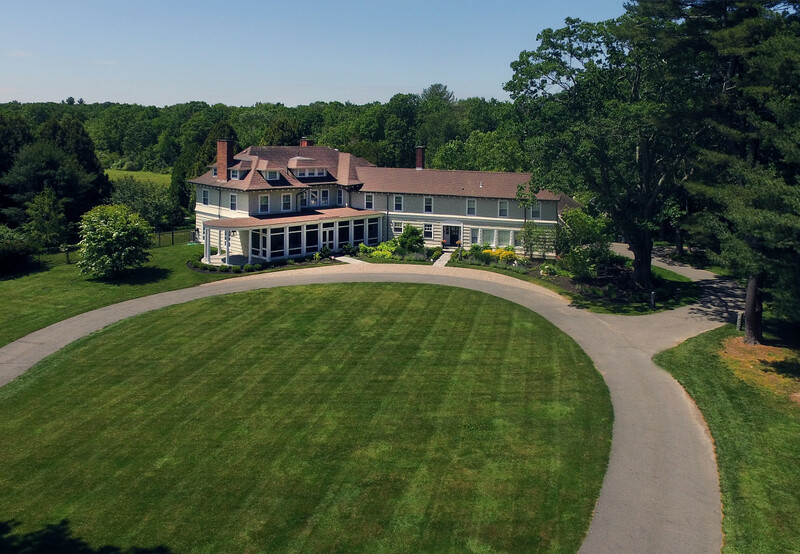 Set back on more than six acres with spectacular views of the grounds and gardens, this magnificent home has high ceilings, hardwood floors, seven fireplaces, large floor-to-ceiling windows, a banquet-sized dining room, formal library, and a welcoming foyer with period details throughout. 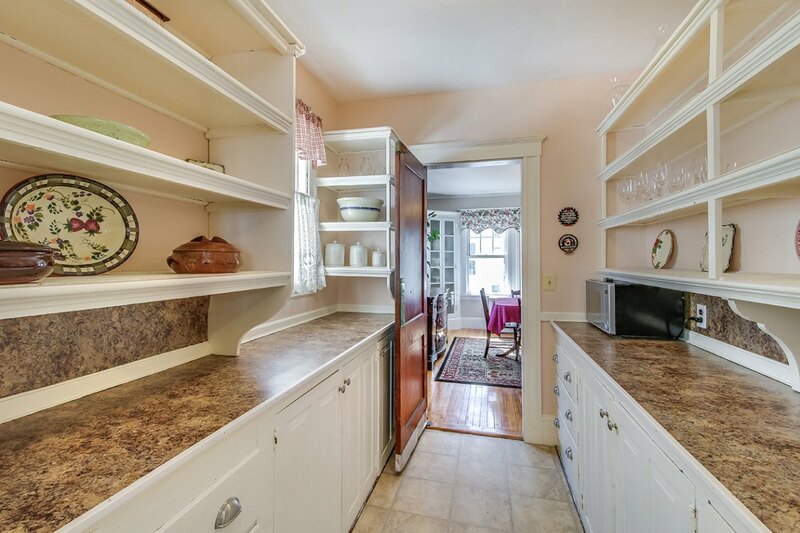 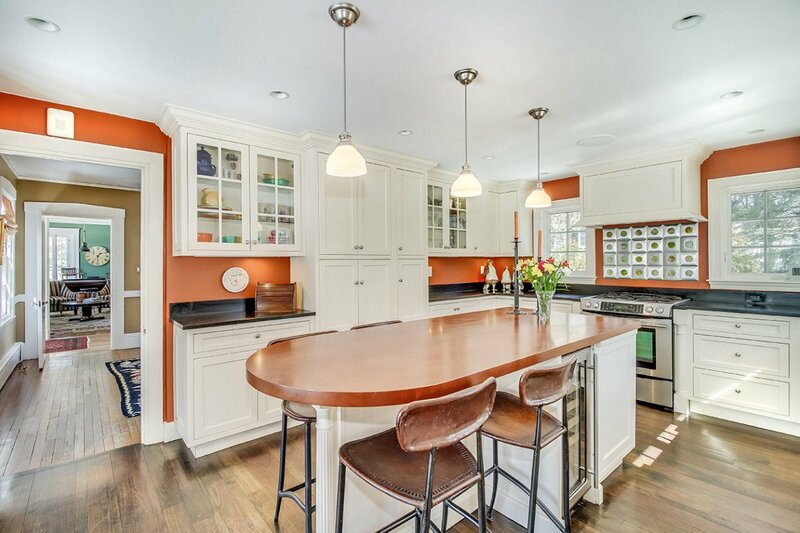 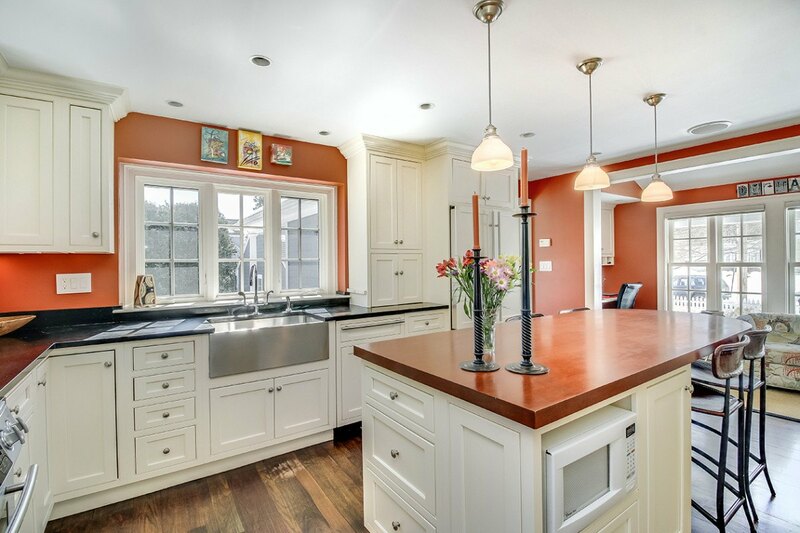 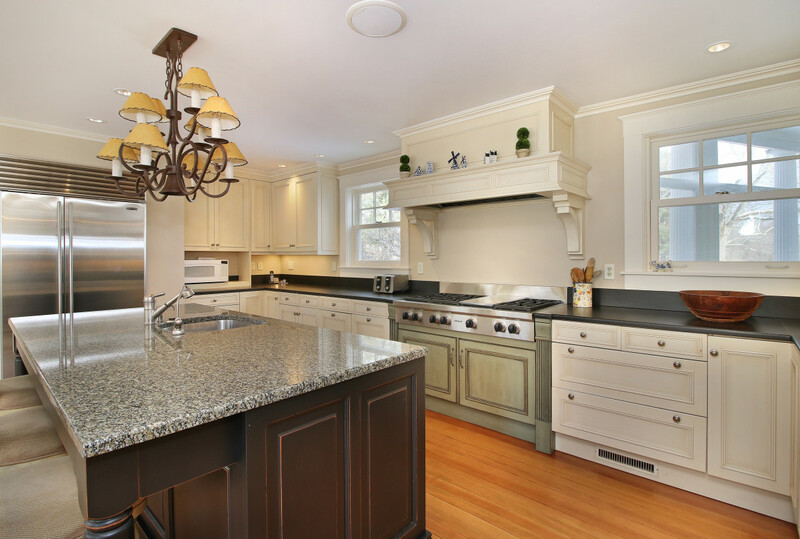 The updated gourmet kitchen comes with a large island and breakfast room, plus a butler’s pantry. 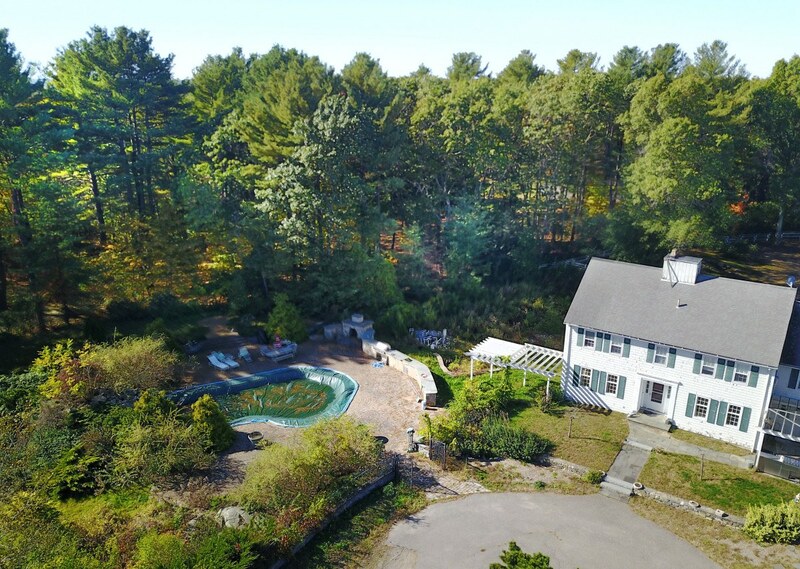 Take a dip or soak up the sun by the inviting in-ground pool, with room for tennis and horses. 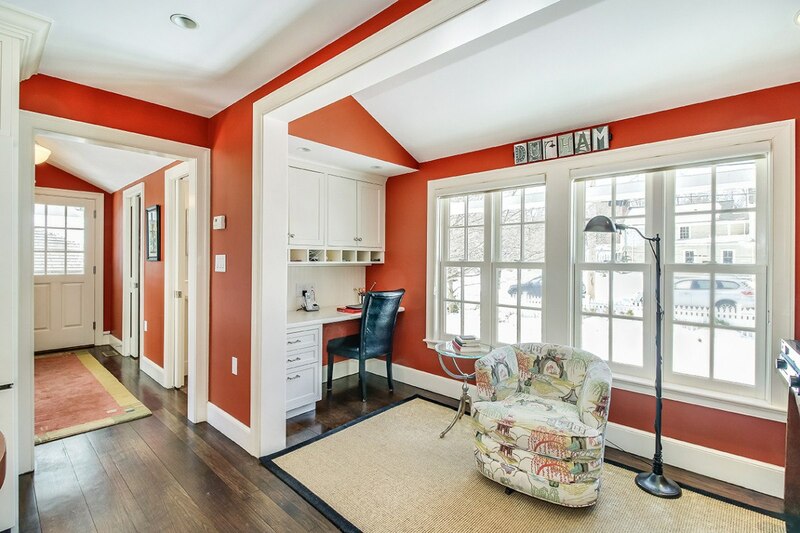 Work from home in the back office or test out your green thumb in the greenhouse that leads to garage. 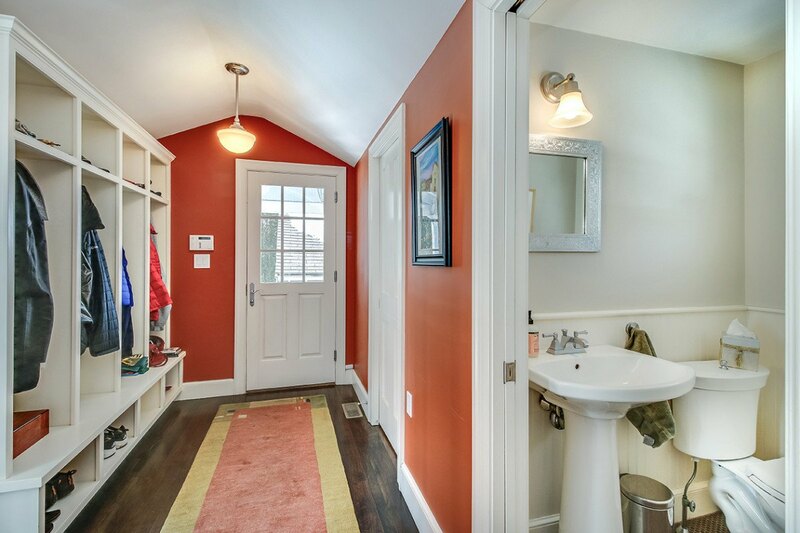 The mudroom comes complete with cubbies for storage, while the master suite features a walk-in closet and modern classic bathroom. 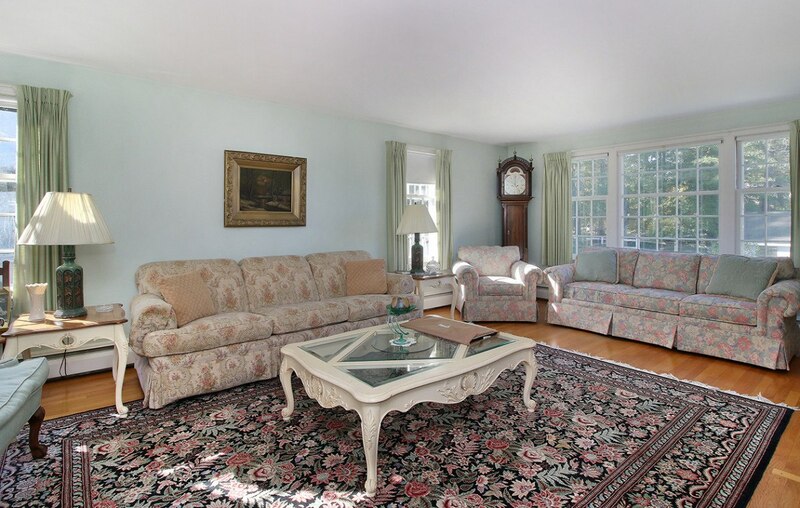 For more information on listings, visit elenaprice.com.